This blueberry ​ice cream is super easy to make and totally delicious. Fresh, ripe blueberries shine through in a cooling, tasty summer treat. Using sweetened condensed milk adds not only sweetness but also body and what's known as a "mouth-feel" that mimics the richness of a custard-based ice cream without the hassle of cooking a custard base first. One key to success with this ice cream is to wait until the ice cream base is at least half-way frozen before stirring in the mashed blueberries, if that's the texture you prefer. This keeps the bits of blueberry suspended in the mixture as a whole instead of dropping straight to the bottom and needing to be re-incorporated once the mixture is fully frozen—a difficult task. Pick over the blueberries, rinse them clean, and pat the thoroughly dry. For a lot of berry texture in the final ice cream, put the blueberries in a bowl and mash them with a fork. For a smoother final texture whirl, the blueberries in a blender or food processor until completely smooth. How pureed or mashed you want the blueberries is completely a matter of taste; the ice cream is tasty either way. In a large bowl, combine the half-and-half, condensed milk, heavy cream, and vanilla extract. If you've puréed the blueberries until completely smooth, stir in the blueberries, too. If you've left them a bit chunkier and mashed, keep them aside for now. Freeze the mixture in an ice cream maker according to manufacturer's instructions. If you haven't added the blueberries yet, add the mashed blueberries once the mixture is frozen to a texture/thickness of soft-serve ice cream. OR, make ice cream without an ice cream maker and stir in the blueberry puree once the mixture is almost completely frozen. Serve immediately if a softer texture appeals. Or, transfer the ice cream to a sealable container, seal, and freeze until hard for a traditional ice cream texture. This will take at least an hour even in the most efficient freezer, and up to overnight in some models. 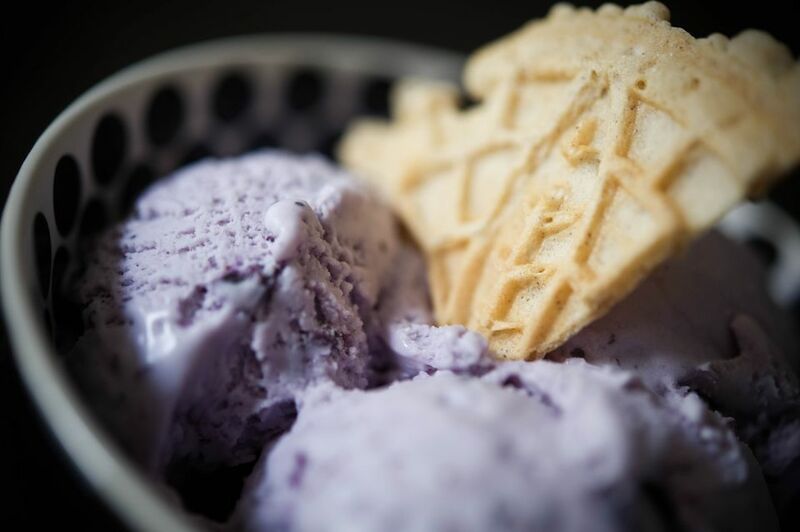 An important note: while this ice cream is an excellent way to use an excess of fresh blueberries from a successful foraging or u-pick adventure​ or a good deal at the farmer's markets, it is just as tasty when made with frozen berries. Look for individually quick frozen (IQF) berries without any added sugar or preservatives for the best quality frozen blueberries. Let the berries thaw, then mash or purée them.